The goal of a Le Cordon Bleu school is to help prepare its students for an exciting career covering culinary arts to culinary operations and management. This well known institution is recognized as the biggest network of culinary and hospitality schools anywhere in the world. 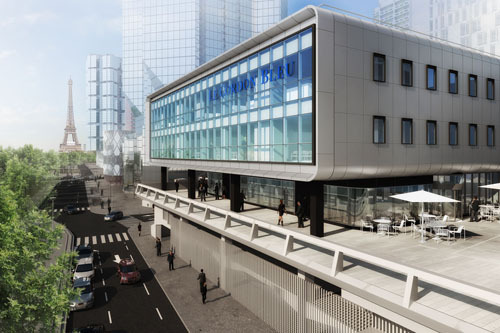 A new Le Cordon Bleu school is scheduled to open in Paris, France. The new school opens June, 22, 2016 and will be located on the banks of the Seine River, near the Statue of Liberty. The new culinary school is also next to the famous Beaugrenelle shopping centre, nearby the iconic Eiffel Tower. It’s expected that the newest Le Cordon Bleu school will enroll greater than 1,000 culinary students each year. They will learn all there is to know about culinary arts and wine, hotel and restaurant management. Their training program education will prepare them for the fast, growing culinary industry. The Paris school is 4,000 square meters in size and will feature the latest modern technology and equipment. The stylish, school building was designed and built to be eco-friendly. With a contemporary look, it was made out of aluminum and glass. As the world’s population continues to grow, so does the number of restaurants. It’s been reported that there is a shortage of chefs. A key driver is the relatively low salary they receive. Receiving an education from a top culinary arts and hotel management institute like Le Cordon Bleu can be quite expensive. The chef profession has always seen a high turnover ration. But the abundance of TV chef shows tend to overly glamorize the profession. It’s hard work and long hours. The result is many chefs unfortunately quit. Below is a summary of just a few of the many features student will enjoy at the new Le Cordon Bleu school in Paris France. • 7 practical classrooms for cuisine, pastry and boulangerie lessons, including one classroom that has been specially designed for teaching Asian cuisine: Thai, Japanese and Chinese. As part of the eco-friendly design, the building’s roof features a large vegetable garden that is 800 square meters in size. Designed to be energy autonomous, the roof, vegetable garden uses heat from the kitchen hoods. That heat then heats up the green house. Rainwater is collected in a rooftop tank and used ot water th plants. Not only to grow vegetables, but the roof garden also provides a hands-on way for students to learn about how various fruit, vegetables, herbs and edible flowers can be grown in a city environment. Le Cordon Bleu provides students around the world training programs covering the following fields: gastronomy, wine, tourism and hotel. Choose from different lengths of programs from an initiation level up to receiving an MBA degree. If you desire to have a career in the culinary field, then be sure to check out a Le Cordon Bleu school where you live. We enjoy sharing the latest news and food industry announcements. Be sure to stop by again and follow our luxury blog.